China’s sharing economy will maintain a high 40 percent annual growth rate in the coming years, according to estimates in a report released by the State Information Center. The report, released by the center’s sharing economy research branch, predicted the sharing economy’s transaction volume will account for over 10 percent of the country’s GDP by 2020, and that the ratio will continue to grow to roughly 20 percent by 2025. China’s fast-growing sharing economy will likely generate five to ten business giants in different sectors over the next decade, according to the report. More individuals as well as more small and medium-sized enterprises will get involved in the sharing economy and benefit from it. The report said the new mode of operation brought about by the sharing economy will penetrate various fields, including products, services, capital, knowledge and skills, as well as production capacity. 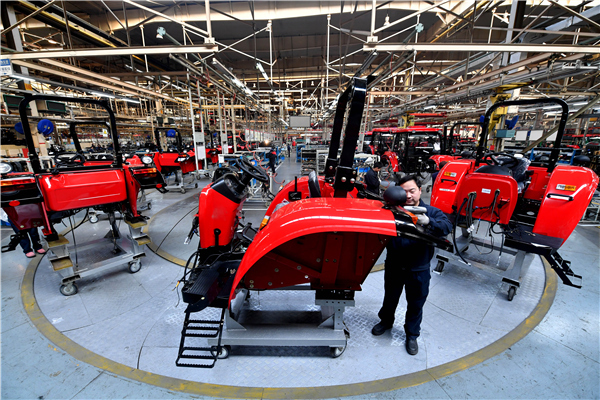 Among them, the sharing of manufacturing capability will be a crucial area amid China’s industrial upgrading boom. “The first aspect is urbanization, which will boost demand for services as more people live in urban areas. The second aspect is an aging population, as elderly people could have more idle resources, skills and experience to share. The third aspect is the popularization of the sharing economy,” said Yao Yudong, head of the People’s Bank of China’s Research Institute of Finance. The State Council issued guidelines that by 2025 the government should promote manufacturing resources and internet platform docking for SMEs. The guidelines encouraged the government to establish a sharing economy platform to further optimize and integrate market information and production capacity. At present, sharing within the manufacturing industry is still in its infancy, but is expected to witness explosive growth in the next few years, according to the report. By 2020, service providers in the sharing economy are projected to exceed 100 million, with up to 20 million participating full time. The development of the sharing economy will be an effective measure to neutralize the job squeeze effect resulting from slowing economic growth and technological advancement. Statistics from the report show that the transaction volume of China’s sharing economy in 2016 reached 3.45 trillion yuan ($503 billion), up 103 percent on a year-on-year basis. During the past year, 600 million people were involved in China’s sharing economy, surging by 100 million from 2015. Among them, the number of service providers reached 60 million, 10 million more than the previous year. Sharing economy platforms created 5.85 million jobs, up 850,000 on a year-on-year basis. “Despite the significant progress made in the sharing economy, the problems coming out should not be neglected,” said Zhao Ying, a researcher at the Beijing-based Chinese Academy of Social Sciences. Zhao said excessive administrative intervention, such as restrictions on use of users’ residences and the vehicle access period for car-sharing services, could affect the growth of the sharing economy. Some existing laws and regulations are no longer suitable for the new business model and therefore new rules should be enacted, he said.